The eACLS™ Course Manual, Third Edition has been developed to assist you, the ACLS provider or instructor, in reviewing the principles and concepts of managing a patient with a respiratory or cardiovascular system emergency. 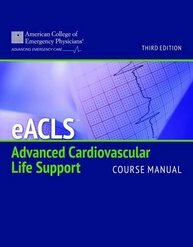 The information and activities in this study guide are intended to accommodate both new and experienced ACLS providers. The study guide is a companion to the American College of Emergency Physicians' (ACEP) eACLS™ course. To learn more about eACLS™, visit www.eACLS.com now.